When I lived in The Gambia in 1984, the country had official relations with Beijing. Chinese aid workers had just completed the extensive agricultural project I was studying, while other aid teams were building four rural health clinics, a stadium, and a brick-making factory. In 1996, after a military coup, Banjul broke relations with Beijing and established diplomatic ties with Taipei. Then, in mid-November 2013, Banjul broke off relations with Taiwan. 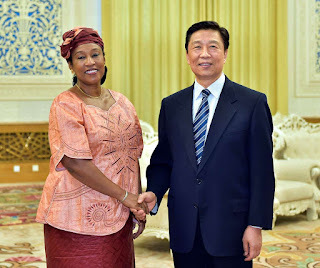 As the Wall Street Journal reported at the time: "Both Taipei and Beijing refuse to recognize any country that recognizes their rival, and any move by China to pursue diplomatic ties with the African nation would likely strain the bonds forged with Taipei after President Ma Ying-jeou (from the KMT party) took office in 2008 and improved relations with China." Thus, for several years, nothing happened. Banjul had severed relations with Taipei but Beijing did not step in to embrace Banjul. Why? Beginning in 2008, the low-key "dollar diplomacy" between Taipei and Beijing was suspended as relations between the CCP and its long-time rival KMT warmed (at least slightly). For a good analysis, see this article. Then, in January 2016, Taiwan elected an opposition DPP president, Tsai Ingwen. Now, it appears the truce is over. The coup was in 1994. Gambia switched to Taiwan almost immediately after.